For 2 days in September, and group of about 35 librarians and storytellers met at the Kent Island Library in Stevensville, MD to share their experiences with using New Media in Early Literacy Programming. We started out with some background information, did some app demos, asked lots of questions and got everyone sharing. It was a jam-packed 2 days where we had more than a few technical glitches, but a lot was learned by all (especially me, and I lead the workshop!) Thanks so much for having me, Sam Eddington and Rachael Stein from the Eastern Shore Regional Library! We also had a number of talented storytellers share some of their experiences. Dorothy Stoltz gave an overview of Every Child Ready to Read. Phyllis Bontrager’s list of YouTube Videos. Rachael Stein’s list of apps and the video she made with the 30Hands app. 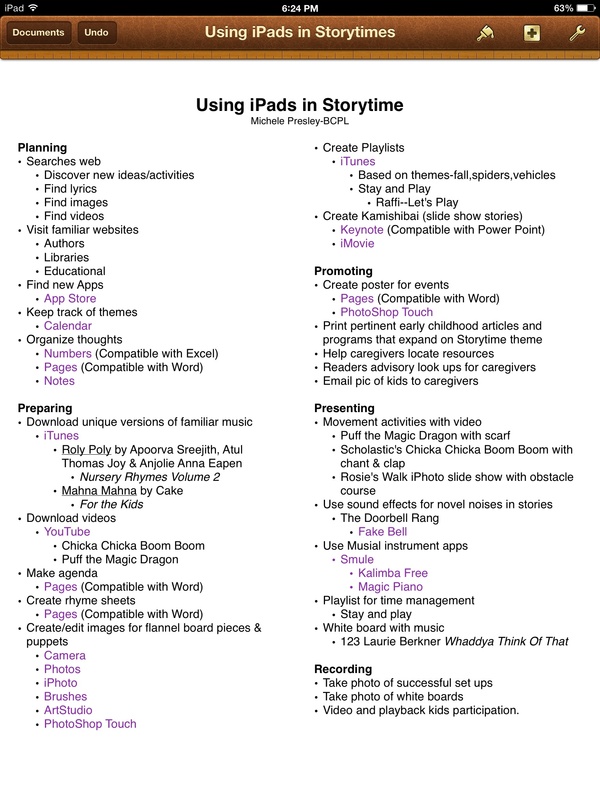 Michele Prestley’s notes on using iPads in Storytime. Posted on October 22, 2013, in Literacy and tagged ESRL, workshop. Bookmark the permalink. 1 Comment.